Slacklining is just one of the activities you can try at a Wanderlust Festival or 108 this season. For tickets and more information, click here. My breath catches in my chest as I scoot off the edge of the cliff. I try not to look down, but eventually my curiosity gets the best of me and I glance towards the cliff bottom, taking in the sheer orange walls. Earlier that same day, I had given up on walking my first highline, vowing that I would go back to Colorado and practice more while finishing up my junior year of college, and try again when I came back to Moab in the fall. That was before my friend Stephanie successfully walked the same line earlier that day—her first time, too. Stephanie and I have always had a loving and supporting relationship—full of healthy competition, always motivating each other to go further and get better. If she could do it, I could too. With this newly solidified conviction, I sat on the line, chose a focus point on the other side, and took a deep breath in. I didn’t give myself time to doubt, and I used my exhale as momentum to stand up. I was balancing! This realization almost knocked me over, but instead I locked my eyes on my focus point and reminded myself to take each breath. Before I knew it, I was on the other side, one step at a time. After six straight days of trying and failing and not making any progress, I’m not sure what clicked, but something did. Immediately upon standing on solid ground, I loudly cursed and untied my leash in a frenzy to get as far away from the edge as possible. I had done it. I grew up in Colorado, but didn’t come from a particularly athletic or risk-taking family. My family was encouraging and fun, but it wasn’t until I was 10 that my dad finally taught me how to ski. Even after that, being outdoors wasn’t my main focus—I was interested in acing my classes, singing in choir, auditioning for my high school’s next musical, and boys. Once I went to college in Golden, Colorado, I found my calling outdoors. At the invitation of my friends, I started regularly skiing and hiking. I hiked to the top of my first 14,000 foot mountain when I was 19 years old, tagging along with some friends after they convinced me that I could probably do it, even though I doubted myself. I started spending more time hiking and at the climbing gym—I loved the feeling of getting to the top, whether it was a mountain or a rock wall. It was at this same college (the Colorado School of Mines), that I started slacklining—it was popular on my college campus. For the first two years of college, I hated it. I couldn’t stand or walk right away and to me it seemed like a waste of time. It turns out, this was just a defense for the fact that I simply couldn’t do it… It was hard, and I struggled to even stand, so I didn’t like it. It reminded me of a part of myself I didn’t like, someone who was weak and couldn’t do things. Regardless, I hung out casually with slackliners on campus, and sometimes unenthusiastically made small efforts to stand and walk. After a few months of irregular practice, I noticed I was getting a little better. This realization encouraged me to practice a little bit more regularly, with a little bit more focus. I can’t really describe the feeling I had the first time I ever walked across a slackline in a park. It was a rush of self-esteem, giddy joy, and a fire of determination lit inside of my core. Even though it was just a tiny park line, it took me so much to get there. If I could work up to that, I felt like I could work up to anything. I invested in my own slackline. It’s not a huge investment—A slackline is just a piece of one-inch webbing, rigged up with carabiners and some basic knowledge on pulleys and creating tension. A person can use a slackline drop into a state of flow very much like in a yoga practice, and push their balance and focus a little further by practicing standing and walking on the line, or doing other “yoga” poses. To put it in perspective, here’s a brief history lesson: Around the 1970s, climbers in Yosemite needed a rest day activity, and rigged up their climbing webbing in between two trees at the iconic Camp 4, and practiced standing and walking on it with control. Modern slacklining was born, and the lines have just gotten longer and higher since. People are now walking highlines a mile long, bouncing and flipping on slacklines (tricklining), doing yoga poses on slacklines (YogaSlackers), jumping off of highlines with a parachute, and even walking highlines without a harness or protection. The truth is, I never thought I’d be one of these people. While I’m still not walking mile-long lines or walking lines without protection or jumping off of them with a parachute (and I’m okay with that), I never thought I’d be able to walk a highline. The process was excruciatingly difficult for me, because I encountered the reality of how I treated myself. When I got out there on a line, I would speak to myself with such doubt and pessimism. I would tell myself that there was no way I could do this, and that I should just try to stand up a few times and fall so that I could get off and get back to my comfort zone on the edge. No one would be able to say I didn’t try, and I could pretend I wasn’t disappointed in myself either. I noticed a stark difference between how I spoke to myself out on the line and how I spoke to others. When others were out there, I was positive and encouraging, and I really believed that they could do it. One day on the line I realized something—I would never speak to someone else with such negativity and doubt, and I would never allow someone else to speak to me that way, why was I allowing myself to do it? With our thoughts, we choose whether or not that physical reality is one of love, abundance, and joy, or whether it’s one of drama, fear, and pain. Highlining sparked an awakening inside of me that I’m still building on to this day—our thoughts create our reality, and they have real weight, and real impact on our belief system, how we feel, and therefore our physical reality. My highlining process didn’t immediately take off after that realization. Treating myself with loving kindness and compassion wasn’t easy—it was a slow and painful process, and one that I still struggle with to this day. But I’m working on it. How we speak to ourselves changes the way we think about ourselves, and what we believe we can do. In turn, what we believe directly impacts what we can do. It’s been four years since I walked my first highline on that day at the Fruitbowl, but I can still feel the fear and the ecstatic joy like it’s happening this very moment. My whole life has changed since that day. If you asked me then what I was going to do, I was going to be an astrophysicists, and work on rockets for Spacex or NASA. But that year marked a loud and sudden revolution in my thought process and priorities that gave way to a slower and more subtle evolution. I graduated school a year later, and with my shiny degree in hand and the dismay of my parents in my ear, I set off to live out of my car, travel, and continue to practice highlining. At the time this felt like a stupid idea, but I just couldn’t truly see myself pursuing physics anymore, and I told everyone I was going to travel and teach yoga. I know it sounded silly to a lot of people (it sounded silly to me), but I knew that if I kept telling people—and myself that it’s what I was going to do, my thoughts would create my reality. Almost three years later, that’s exactly what I’m doing. After taking two yoga teacher trainings, an Acro teacher training, and a slacklining teacher training with the YogaSlackers, I’ve traveled and taught yoga, acro, and slacklining on three different continents. I’m currently based in Moab, where I get to highline all the time, and I am running yoga, acro, slackline, and adventure retreats here through my business partner’s company, Wild Sol Retreats, as well as traveling and teaching as a YogaSlackers Teacher at many of the Wanderlust Festivals. Early on, training and teaching as a YogaSlackers teacher opened the door to this kind of lifestyle. Meeting them was the first time I really thought to myself, Maybe making a life out of this is possible.” The YogaSlackers have exposed more people to slacklining than I can even begin to fathom at Wanderlust Festivals and through workshops and retreats. But truly, the slackline community is growing exponentially—anyone can be a part of it. I can’t really speak justice to the importance of my connection with slacklining and the lifestyle it has opened up for me. The deepest things in our heart and souls just don’t fit inside the container of the words we describe them with. Sharing slacklining is a way for me to express love to people. Slacklining is not the “answer” and it’s not for everyone, but it is the path that I chose to help me love myself, and live a better and more fulfilling life. When I share slacklining, I’m openly sharing part of my authentic self with others, and it’s the tool I use to guide others towards loving themselves and leading a more fulfilling life. Athlete and adventurer Michelle Griffith is driven to help guide others towards their passions. 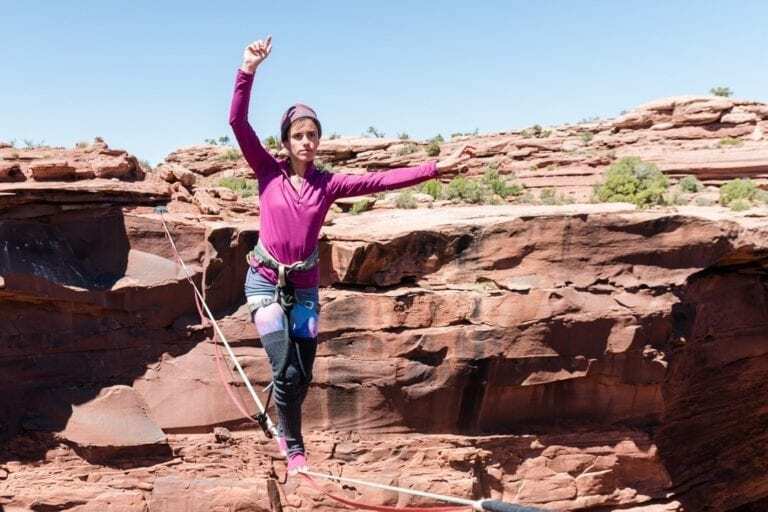 A resident of Moab, UT., she loves galavanting around the canyons, and spends most of her time practicing slacklining, highlining, canyoneering, partner acrobatics, yoga, paddleboarding, and traveling. She currently serves her community by offering yoga at Moab Yoga, building a thriving AcroYoga community with weekly classes and jams, and guiding adventure retreats in Moab and surrounding area through Wild Sol Retreats. Michelle also teaches at festivals and runs retreats worldwide, offering activities such as slacklining, slackline rigging, partner acrobatics, and acroyoga. 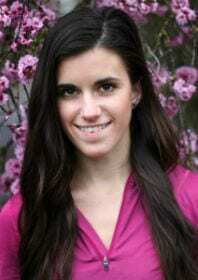 Michelle works with the YogaSlackers as a certified teacher, event outreach manager, and social media manager. She has also been certified to teach partner acrobatics through AcroRevolution. Check out Michelle’s website, Facebook, and Instagram to follow her adventures.